The remains of the village of Eccles-next-the-Sea, which, together with its church (NHER 8346), were engulfed by the sea and abandoned in, probably, the 1570s. The site of the village is now under sand, but is occasionally exposed by tidal action. These exposures, together with partial excavations, have revealed wells, structural foundations, a hollow way and stonework. Medieval objects have also been found. Some elements of these features are visible on aerial photographs, in particular those taken after the large scour event in 1991. 1839. Wells exposed by sea. 1907 - 8. Circular building exposed by sea, with pottery. 1986. Tidal scour revealed hollow way, well etc with organic remains and pottery. Part excavation followed. 1991 - 92. Medieval pottery and stonework, and ten wells exposed by sea. Also various structures and small finds. 1995 - 96. Metal detecting. Pilgrim badge and weight. 1996. Keel of vessel washed up. See full notes in file, including copies of reports (S1), (S2) and (S3), monograph (S4), photographs (S5) and press cuttings (S6-9). E. Rose (NLA), 5 Sept 1996. A number of timber circles were discovered at Eccles in 1908. The timbers were supposedly oak, birch and hazel and were arranged systematically in circles, each within four larger posts arranged in a square. Within the circles was another circle of wattle or wicker-work. Excavation revealed bones of domestic animals including sheep and pig. A piece of Saxon pottery was also recovered. THIS SITE HAS BEEN EXTENDED CONSIDERABLY TO THE EAST TO INCLUDE THE LOCATIONS OF THE EXCAVATED FEATURES AND THE NMP MAPPING. THEREFORE THE CENTRAL GRID REFERENCE HAS BEEN ALTERED FROM TG 4129 2893 TO TG 4135 2889. The exposed remains of a series of wells, a roadway and the walls of St Mary’s churchyard and scattered tower fragments (HER 8346) are visible on aerial photographs (S11-13). The centre of the whole archaeological complex is TG 4135 2889. The church tower fabric is visible on several years aerial photography (S11-13), although the majority of the archaeological features mapped were only visible on aerial photographs taken shortly after a particularly severe tidal scour event in 1991 (S13). The scouring of the sand from the beach exposed a series of archaeological features cut into the underlying clay. The aerial photographs do not show the full extent of the archaeological features recording during the archaeological survey and recording on the beach (S2-3), which were spread over 150m along the coast and approximately 35m out towards the sea. The mapped features covered only a 100m strip, centred on the church ruins at TG 4141 2882, and were mainly located within 25m of the sea wall. Due to inadequate control points on the 1991 aerial photographs the archaeological features and surfaces visible were mapped using the excavation plans as base maps. 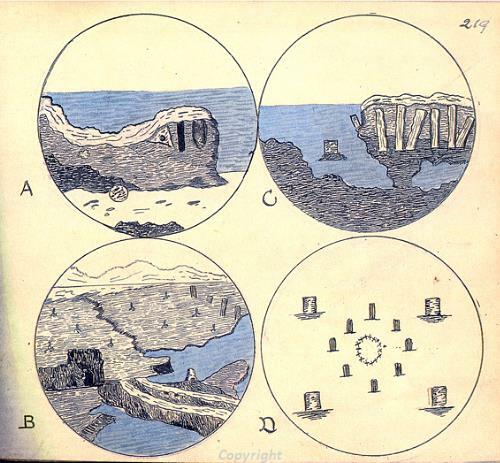 One potential inaccuracy of this method is suggested by the fact that the groynes on the excavation plans are depicted as being perpendicular to the sea wall. This positioning is not apparent on the aerial photographs and map. However these drawings do provide the only overall plan of the site in the absence of better control points. The aerial photograph mapping offers little new evidence for the site, other than to position these features onto the map base. The exposed fabric of the church is centred on TG 4141 2882. Two of the excavated circular wells (features 56, 110) are located at TG 4138 2882 and the square well (feature 30) to the east is visible at TG 4145 2879. Running up towards this is the exposed road surface (feature 104), which appears to have some exposed masonry or compacted material along the northern edge. Perpendicular to this is a linear ditch or slot, with embanked or raised material on either side. This is following the alignment of the churchyard wall to the north. Running in-between the exposed road and groyne to the west is a linear spread of masonry and stones washed against the sea wall. A slight curving linear feature, 7m long, is visible coming out from the eastern end of this spread of material at TG 4143 2879. It is not clear whether this represents an archaeological feature projecting from the surface or whether it is edge in the strata of the peats and clays. It is not marked on any of the sites plans and therefore on the ground this feature may have been of obvious natural origin. The linear feature 43 is visible, as is a linear gully appearing from under the western side of the groyne, centred on TG 4141 2884. This appears to have exposed masonry along the western side and may be the remains of a wall or roadway. It runs towards the location of the another circular well (feature 45), which was not visible on the aerial photographs. The roadway 54 is also visible to the west of the groynes and the circular wells. S. Massey (NMP), 10 April 2005. A possible exposed stonework or concrete structure was identified on aerial photographs, during the NMP mapping of this area, see NHER 27325 for details. The feature is visible shortly after the 1953 storm event and may have been exposed by storm scour, although it could equally be modern debris from the flood. The structure or feature is not clear enough for a definite identification and therefore it is not possible to deduce whether it is part of this medieval settlement site. It is also possible, given the amount of World War Two defences in the area, many of which were dug into the dunes and sea walls, that the rectangular structure could be part of a previously covered military defence. S. Massey (NMP), 18 April 2005. Research suggests that the village etc was probably ruined and abandoned in the 1570s, after three major storms (S14). D. Gurney (HES), 5 March 2012. --- Unpublished document: W.H.Cooke. 1909. Eccles next the sea, Happisburgh, and the Erosion of the East Coast. Notes collected by W.H. Cooke..
--- Archive: Clarke, R. R. and NCM Staff. 1933-1973. Norwich Castle Museum Record Card - Medieval. Lessingham. <S1> Unpublished document: Stannard, D.. 1986. Report on features exposed on upper foreshore near North Gap, Eccles..
<S2> Unpublished document: Pestell. T.. 1990. Archaeological Investigations on the Foreshore of Eccles Beach, Norfolk.. October. <S3> Unpublished document: Pestell., T.. 1993. Archaeological Investigations on the Foreshore of Eccles Beach, Norfolk. Second Interim Report.. February. <S5> Photograph: Exposed posts and wickerwork structure northwest of church. <S6> Newspaper Article: Eastern Daily Press. 1947. Eccles Beach Erosion Brings Ruined Church to Light. 17 March. <S7> Newspaper Article: Eastern Daily Press. 1991. Lost village project is race against tide. 10 August. <S8> Newspaper Article: Eastern Daily Press. 1995. Lost in time. 24 January. <S9> Newspaper Article: Eastern Daily Press. 1999. Seahenge Mk II doesn't have a Bronze Age relative after all. 2 February. <S10> Correspondence: Fiske, R.. 1999. Letter regarding the timber circle at Holme.. 24 January. <S11> Vertical Aerial Photograph: RAF. 1946. RAF 106G/UK/1634 3097-8 09-JUL-1946 (NMR). <S12> Vertical Aerial Photograph: RAF. 1953. RAF 540/1005 0163-4 04-FEB-1953 (NMR). <S13> Oblique Aerial Photograph: Edwards, D.A. (NLA). 1991. NHER TG 4128D-R (NLA 289/GGM4-13) 29-APR-1991. <S14> Verbal communication: David Stannard. 2012. <S15> Newspaper Article: Eastern Daily Press. 2012. Revealed - the secrets of Norfolk's lost villages. 18 August.